Could Sarah Palin be right about the new movie Game Change? 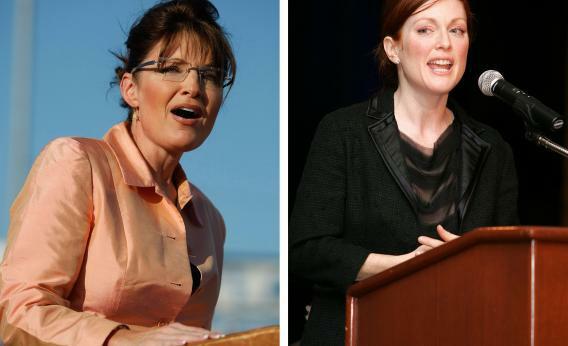 Julianne Moore as Sarah Palin in Game Change. Sarah Palin’s people have given their final word on HBO’s Game Change, the show which premieres this weekend based on the book of the same name. On her Facebook page and SarahPAC, Palin’s people repeated their talking point that the movie is “historical fiction,” with the emphasis on fiction - “a series of scenes where the dialogue, locations and participants are invented or rendered unrecognizable for dramatic effect.” Palin even recorded her own fake trailer which rises to the dramatic crescendo of Palin’s awesomeness, and thus is as boring and un-dramatic as any average campaign commercial. The second seems like the frail lunatic who crumples on the couch and has to be gently managed by all the male handlers. From the book Game Change on which the movie is based this portrayal has plenty of truth in it, but it also happens to be Hollywood’s favorite way to handle the female pols, by overemphasizing their hysterical, domestic dramas – The Iron Lady being the latest example. New York magazine recently ran an interview with Julianne Moore, who plays Palin in the movie and seems genuinely sympathetic to her. But again, this sympathy is slightly condescending no? Palin may be wrong about most everything but she is not wrong that you really can’t trust the Hollywood liberals to make a decent show about politics. Ides of March was merely the latest movie revealing the industry’s embarrassing fantasy about what a perfect American candidate looks like: recycles, has gay friends, doesn’t believe in God, is indifferent to fashion but is nonetheless as handsome as George Clooney.